It’s another cold, bright day, with tightly furled crocus buds emerging but not yet daring to open. The light still angles deep, as in winter, and it retains a cold, sharp, colorless intensity. But you can almost feel the looming fecundity of the earth underfoot, even in places where the bare mud has refrozen to concrete hardness. Even through the earth’s obdurate solidity, you can almost feel the subtle rumbling of a tangled universe of roots awakening: spring in training. If you follow me on Twitter, you might recognize today’s photo as being the inspiration for this morning’s Tweet. Perfect! 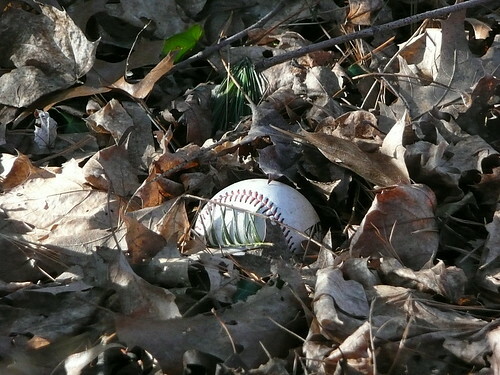 This is my favorite of the early spring series. Fittingly, last night Big Papi hit a home run and our guys defeated the MFY in a grand ST game. Also, congratulations on one of your very fetching photos appearing at Bostonist yesterday. I hope the day was as perfect for you as it appears from here. Yes, there’s something about the color & texture of last year’s leaves that I’m loving right now. This “Easter egg” baseball really caught my eye, so I’m glad you liked it! The light is definitely brightening — it’s still a bit wintry, as you say, but there’s more warmth to the sun, even on cold days. I appreciated your Twitter comments, by the way. I’m always interested in the ways people find to use new technologies!